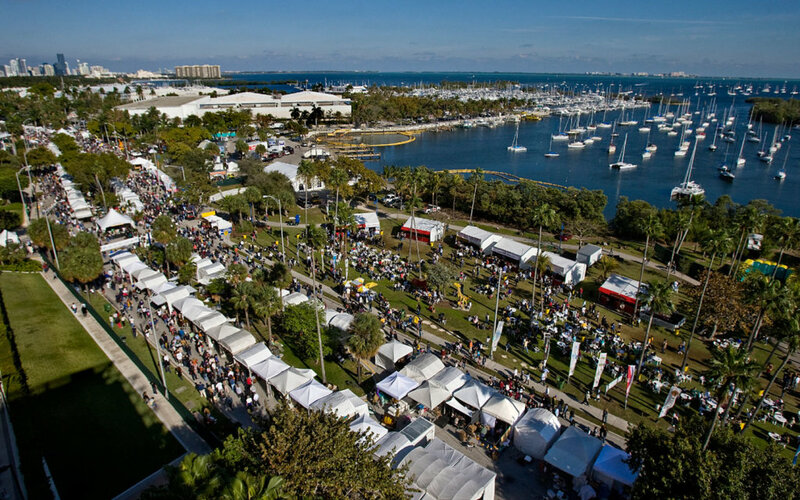 Celebrate Presidents Day Weekend at the Coconut Grove Arts Festival overlooking Biscayne Bay with artists, entertainment and gourmet food vendors. The Coconut Grove Arts Festival returns Presidents Day Weekend, February 16-18, 2019 for its 55th annual edition. Youll enjoy the works of 360 international artists selected by a jury from an applicant pool of more than 900 people in mediums ranging from painting to photography, mixed media, jewelry, sculpture and other forms. Artists hail from across the country, around the world and right here in Florida. The festival also encompasses culinary arts, entertainment and family activities, transforming a mile of Biscayne Bays coastline into an arts village. The grounds extend from McFarlane Road to South Bayshore Drive, Pan American Drive, Peacock Park and Regatta Park. Early on Coconut Grove was known as a laidback, artistic bohemian community with lots of galleries. With that many artists, you needed three days to celebrate them, says Monty Trainer president of the Coconut Grove Arts Festival. Kroma is at the center of todays gallery scene in Coconut Grove and youll also find impressive collections at The Ritz-Carlton Coconut Grove. On the first Saturday of every month, Coconut Grove celebrates Fashion, Art & Music Nights. During the Coconut Grove Arts Festival, art lovers wander from stand to stand in a gorgeous al fresco environment where artists showcase everything from digital art, fiber, glass, clay and metal work. Youll also have the chance to witness live art demonstrations. The festival is a great opportunity to buy original art for your home or as a special gift because the range of talent and work is truly spectacular. You cant have an art festival without delicious food for sustenance and the Coconut Grove Arts Festival delivers with more than 50 restaurants and gourmet vendors on hand. Youll delight in cooking demonstrations and fresh bites from local chefs. One year, Spanish celebrity Chef Pepín broke the Guinness World Record for the largest arroz con pollo dish weighing in at over 4,000 pounds, so anything is possible. Surprising treats are always in store! The festival also promises entertainment by way of live music that inspires dance parties or as a pleasant soundtrack while relaxing on the lawn at Peacock Park. Theres also a new kid-friendly Family Zone in Regatta Park packed with activities, crafts and entertainment for the whole family. From art to entertainment, music and family fun, the Coconut Grove Arts Festival is a no brainer for Presidents Day Weekend in Miami.